Image Credit: King George VI inspecting the Royal Canadian Contingency; Victoria, May 1939. BCA A-01518. George VI understood that with war approaching the support of both Canada and the United States of America would be crucial. It was with this in mind that the 1939 Royal Tour became one of the most carefully orchestrated Royal Tours in history. Even the cars used were custom-built to create maximum visual impact. Note the emphasis on alliance with the joined flags in the officially approved memorabilia. George VI was the first British King to tour Canada and the United States of America. Highlights of the 1939 Royal Tour in British Columbia included travel by Royal Train, an engine type ever after called the Royal Hudson. On May 29th they left Banff, stopping briefly at Kamloops and then entered Vancouver, where large enthusiastic crowds greeted them. The King and Queen boarded the Princess Margueritefor Victoria, where they opened the Legislature, lunched at the Empress and presented Colours to the Royal Canadian Navy in Beaconhill Park before returning across western Canada to New York State. 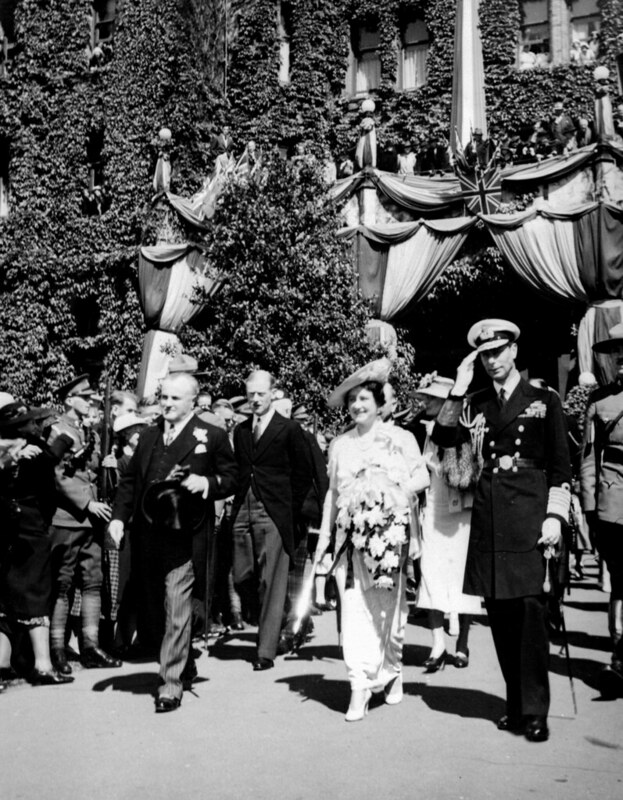 New Westminster; visit of King George VI and Queen Elizabeth, May 31, 1939. BCA H-04736.